Summer time is here. And with it, a whole host of skin care issues too. The scorching heat of summer, UV light, pollution, dust can wreck havoc on your skin, leading to dark spots, pigmentation, wrinkles, and tanning. Oily skin gets oilier, and dry skin gets patchy. There are breakouts and pimples, rashes and roughness, and that acne just wouldn’t go away! Luckily for you, we have some expert advice on beating the heat this summer and keeping your skin beautiful. Here’s a definitive guide offering tips on skin care, hair care, and makeup during summers to avoid all these hassles and to keep your skin radiating like before. Just a few simple changes in your everyday skin care regimen can ensure that you are all set to glow through this season too. Here are few summer skin care tips that can come quite handy. Moisturizing is absolutely essential during summers too. You may think your skin cannot get dry during summers but that’s a myth. Moving in and out of air-conditioned areas alone can cause your skin to dry out. This is applicable not just to facial skin but the entire body. The problem with summers is the extreme heat that dehydrates your body and makes your skin dry. Dry skin is prone to damage and dullness, and you need to butter it up to make up for the moisture loss. The moisturizer acts as a barrier for pollutants, bacteria, and sunburn. Choose a non-greasy, gel/water based moisturizer that contains vitamin E, and apply it liberally every day on your skin to keep it moisturized and supple. Your body sheds skin cells at an amazing rate every minute of every day. If you don’t get rid of them, they’ll just set in on your skin making you look dull and dry. For any treatment or cream to work on your skin, it needs to be clean. For that, you need to exfoliate at regular intervals to slough away the accumulated dead skin cells that are clogging your pores and forming a layer on your skin. No matter how much lotion you use, you’re never going to have glowing skin if you don’t exfoliate. Exfoliation also makes your face a better canvas to apply makeup on. You can use any homemade or market-bought exfoliators that suits your skin. Grab a body scrub and hit the shower. Gently rub your exfoliator in circular movements on your entire body from the shoulders down (you’ll want a facial exfoliator for your face and neck) and rinse clean. Avoid doing this right before you go out in the sun or for a swim. Also, do not exfoliate every day because that can cause over scrubbing of the skin and lead to redness, rashes, and breakouts. Exfoliate your skin 2-3 times a week for year-round beautiful skin. Preferably not right before you go out in the sun or for a swim. Do you step out in the sun without wearing a sunscreen? You should not, because it is a necessary step you need to follow in summer and every other season to protect your skin. Protect your skin with sunscreen before it gets damaged by the sun, because; let me remind you, prevention is better than cure. Sun rays are a cause for many skin issues, such as dry skin, brown spots, and fine lines. Choose a sunscreen with at least SPF 30 and apply it generously on your skin. Reapply it every few hours. While stepping out, make sure your eyes are covered with sunglasses to protect your eyes from ageing. We often forget that the skin around the eyes is very delicate and needs extra attention. If too much heat is making your eyes burn, then wash them with clean and cold water. Aloe vera comes to the rescue for a lot of skin problems. During summers, it cools off your skin after a long day in the sun. Aloe vera is anti-inflammatory and moisturizing. It calms the skin and nourishes it intensely. It also contains antioxidants that protect your skin from damage. Either pluck fresh aloe vera and scoop the gel from the leaf to apply it to your skin, or you can choose from the many aloe vera products available in the market. Avoid anything that blocks your skin pores. Because clogging of pores leads to skin irritations, infections, and the most dreaded one – acne breakouts! Your daily use skin care products have to be non-comedogenic, because pore blocking products can cause dead skin cells and bacteria to pile up on your skin. Also, you are continually sweating in summers, and you do not want that to combine with the oily and pore blocking products on your skin and result in more trouble. Overall hygiene can go a long way in tackling the heat. Having a bath twice a day will not only keep your skin fresh, it will also help combat summer lethargy. If you are prone to prickly heat – a bucket-bath with neem leaves can help. People who suffer from body odour can also benefit from regular bathing. Chlorine water can speed up the process of tanning, that is the reason why we tan more in the pool than ordinarily. Make sure you bathe after a swim to get the chlorine off your body. Stay indoors from 11 pm to 5 pm. And at other times, protect your skin and hair with a scarf (preferably white) and umbrella and wear sun shades. Always carry a water bottle wherever you go and take frequent sips to keep yourself hydrated. Choose white or light coloured clothes while going out to reject most of the heat. We know summer style is all about wearing off-shoulder tops and short dresses. But, don’t go overboard with these styles during the day when the sun is harsh. Covering most part of the skin with comfortable fabric is beneficial to avoid contact with direct sunrays. Drink a lot of water. The problem with summer is, it makes you sweat a lot, making your cells lose water quickly. Besides water gets evaporated from skin due to dry, hot climate of summer even when you are not exposed to direct sun. This loss of water in your body need to be compensated proportionately. To maintain moisture levels in your body and not feel weak or faint due to dehydration, and to keep your skin healthy and beautiful, you need to keep a check on your water intake and get it right. Ideally, drink at least 8-10 glasses of water every day and include lots of other liquids like buttermilk, fresh juices and fruits with high water content (like watermelon) in your diet. If you drink caffeinated beverages, you must triple the amount of water you drink! What we eat has a lot to do with how we look and feel. Follow a healthy diet – an excellent mix of fruits, vegetables, nuts, milk products, cereals, and pulses. A fine balance of all the nutrients that your body requires. During summers, increase the intake of raw or boiled food. Include as many fruits and veggies in your meals as possible. Go for seasonal fruits and vegetables. Try vegetable juices and natural alternatives like Coconut Water to hydrate yourself and feel fresh. Avoid oily, fatty, deep fried foods. They make your skin dull, and make you feel lethargic when you already feel beaten down by the heat. Make sure you are getting enough calcium as well. Also, nuts are an excellent addition because they are excellent for your skin. The heat during summers damage your hair texture and build. It causes dryness and a lot of frizz. Deep condition your hair to add life back to it and provide it with the moisture it needs. The best way to do so is by giving your hair a warm coconut oil treatment. Heat a cup of coconut oil, massage it into your hair and scalp, wrap your head in a warm towel and leave it on for an hour. Wash the oil off, and you can feel your hair getting soft and nourished. Here are a few makeup tips that you can follow in summers. Summers are the time to shift to lighter shades of makeup – be it lipsticks, eyeshadows, nail polish, etc. It is all about going natural during the summer season. Your skin already gets a beautiful sun-kissed glow during summers, and all you must do is enhance it with pleasant and light shades of makeup. Cream eyeshadows are a boon in summer. They do not melt quickly. They stay longer and are water-resistant. Also, powder eyeshadows easily mingle with the oil and sweat on your face and clog the pores. Shift to cream eyeshadows and stay safe. Do not forget to use a primer in summers. It will hold your foundation well and keep it together as summers are the time when your foundation can easily melt and get blotchy. Primer is a shield between the foundation and your skin’s oils – it prevents the oils of your skin from melting the foundation on your face. It’s common sense to choose waterproof eye makeup in summers because you do not want your mascara running down your face. The skin of your lips is very sensitive. The hot sun during summers dries the delicate lip tissue and leads to thinning, scales, and spots. Get a luscious lip balm with SPF and apply it generously on your lips to protect them from the sun. 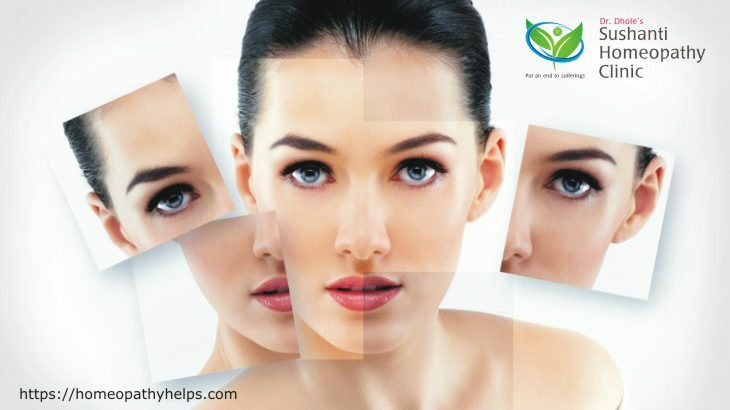 You can’t have a wonderful skin if you have some skin ailment that is not responding to conventional treatment. If you have any chronic skin or hair complaints like Acne/Pimples, Allergy, Eczema, Psoriasis, Melasma / Pigmentation, Scars, Hair Loss / Alopecia that you are struggling to get rid of for months or years, it is right time to switch to homeopathy. For all chronic diseases of skin and hair, homeopathy is highly simple, absolutely safe and extremely effective giving long term relief from complaints. Consult a qualified and experienced homeopathy doctor or order your customized homeopathy treatment from our clinic by submitting required details online. Summers are a great time to go outdoors (not during peak afternoons though). While you enjoy a pleasant walk or a quick swim at the beach, your skin and hair shouldn’t suffer. Just make sure you balance the outdoor travel with a good skin care regimen and protect yourself from the harmful impact of sun rays. The above tips are perfect problem-fixers and will help you enjoy your summers more. Have anymore actionable summer skincare tips? Please share it in the comments below! Sciatica: Which treatment option is best for you?